On holiday in East Anglia with his wife, a distinguished judge becomes the focus for shocked and exultant disapproval when strong sea breezes spread about the beach the contents of his weekend briefcase- the hard-core evidence in an obscenity trial. An attractive, urbane young London couple, motoring through Gloucestershire, are scandalised by a sexual encounter between white-haired lovers in an overgrown churchyard. In a secluded cottage among scented fields, hearing a kindly old lady’s horrifying tale a barbarous cruelty, a young country girl catches a sudden chilling glimpse of the darkness inside. Spinster sisters, cocooned inside their large and comfortable Georgian house in a Worcestershire market town, are tumbled into the discordant world outside their high brick walls by a succession of event beyond their control. In other stories, exploring other themes, a young biographer uncovered evidence of a dead poet’s long and passionate love affair which becomes more real and fascinating to him than his own; a teacher of English literature, visiting a wartime pill-box, is haunted by alternative realities; and four village women put an end to the roamings of a randy tomcat – and its coarse and cocky owner. At once elegant and sensual, thoughtful and touched with humour, Penelope Lively’s work is an extraordinary pleasure to read. With its feast of characters, moods and settings, this outstanding book of stories shows her at her most inventive, versatile and accomplished. "Penelope Lively’s new collection of short stories is filled with gentleness and humour. She is an accomplished writer, a shrewd observer of human nature." "Each of Penelope Lively’s stories is beautifully written, full of irony and gentle, pointed humour and perfect descriptions." "She has the supreme gift of never being dull." 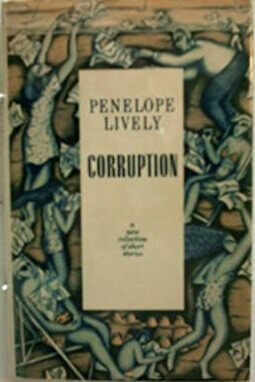 "CORRUPTION, short as it is, contains more good writing and acute observation than is to be found in many stouter books, and leaves one all the move impatient for Penelope Lively’s next novel."